The Cranefly Nymph was developed as a variation of Polly Rosborough’s fly, the Casual Dress. He mostly used muskrat with the guard hairs for the entire fly. My rendition uses muskrat for the tail, a body of gray wool dubbing and a front collar of muskrat. The guard hairs should also be included in the tail and wing and the body should be picked out to make it look buggier. Both of these patterns use black ostrich herls for the head. 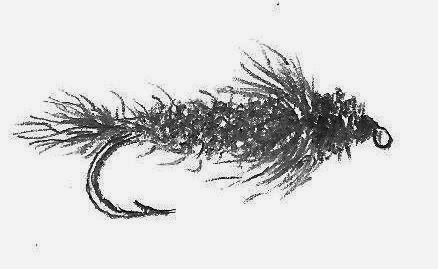 The main difference between the flies is that the Cranefly Nymph is not as bushy as the Casual Dress and that wool dubbing is used instead of muskrat for the body, making it quicker to tie. Both flies are effective because the muskrat fur breaths and pulsates in the current. This undulating motion simulates a live and edible insect like the cranefly and other types of larva.